Last night we recorded the latest episode of AggroChat. This week we were joined once again by Tam and the regular cast of AggroChat… Asghar, Rae and Kodra. I went into the night thinking we would end up gushing about Destiny quite a bit, but in truth it turns out we all have a some very valid complaints about the game. We do in fact talk about the good points, but also we talk about the weaknesses of the story. Moreso we talk about the fact that there really isn’t much of a story at all. Apparently this week some craziness happened in League of Legends with the team Unicorns of Love. It seems as though they broke one of the taboos of the game and played Poppy in competitive play More so than that they seemed to dominate a match with her. We talk about the ramifications of this and get into an offshoot discussion about what happens when something is toxic for a game. When a game changes the class or mechanic that you love, what do you as the player do? I know a good part of why I wont be playing Warlords of Draenor, at least not at launch is the fact that Blood Deathknights “feel wrong” in ways I cannot quite quantify. Since the last three days have been spent working on my Easing Into Eorzea guide series, I have not really posted much that was actually about me or my endeavors. In fact this morning it feels more than a little weird to not be working on the next segment of that guide. I guess in part I wanted to get some of the most basic information out there especially since I have a good number of friends either just starting the game or considering starting it. One of the problems with Final Fantasy and just how content dense it is, is that it has so many different systems that it just expects you to know how to use. I remember when we first started playing, it took me weeks to figure out what everything did and even to this day I am still finding systems that I knew nothing about. So my goal was to try and flatten this learning curve by discussing things from the perspective of a player who is used to playing traditional western MMOs. However this does not mean that I stopped doing things while writing these guides. One of the most exciting things from the past week is that I managed to get Tidal Barding. 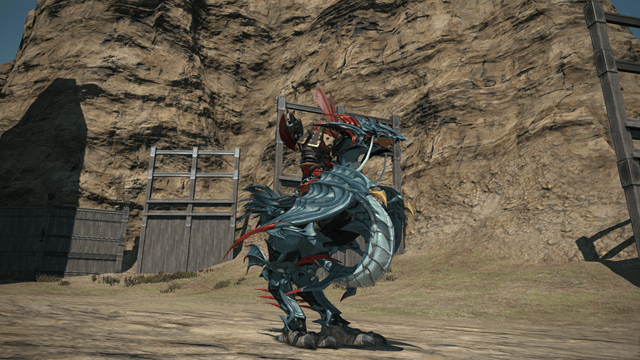 The entire reason why I was going for Turquoise color with my chocobo, was that it would match the Leviathan bardings perfectly as seen in the picture above. Leviathan has been my favorite summon since Final Fantasy IV and as a result I knew when I saw this that I would have to get it for my chocobo. The problem is that it involves getting a rare drop from Extreme Mode Leviathan, when I have not done any of the Extreme primals leading up to that. The other issue is that it is a three star armorcrafting pattern, meaning it takes an extremely well geared crafter. This is the point at which my good friend and awesome cosplayer Spiral Sun rides in to the rescue. It turns out her Free Company leader could make the barding, so I shopped around on the market and managed to piece together all the bits needed. All told I think I spent around 150,000 gil to gather up the bits, which is a significant discount over what the completed barding had been going for on the market boards. Last night I checked it was still floating around the 500,000 mark. So thanks to Spiral I am now sporting my spiffy barding, and with the Turquoise color it works almost perfectly. The barding and bird kinda meld together perfectly and it feels like I am in fact riding around on a tiny Leviathan. The other thing I have been working on in Final Fantasy XIV is my Animus Weapon. 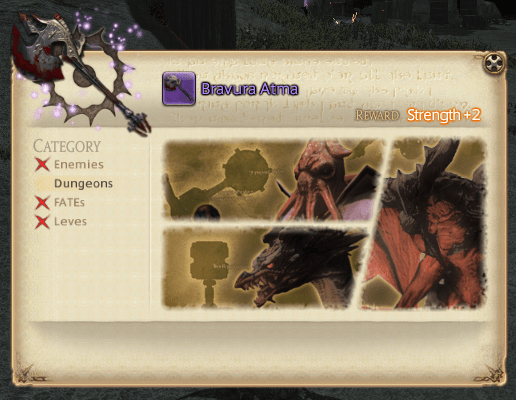 Late last Sunday I managed to wrap up my Atma grind and I was able to convert my Bravura Zenith into a Bravura Atma. The problem is the Atma step is basically a “half step”. While the weapon is in fact ilevel 100 instead of ilevel 90… the stats of it remain the same. You power up the Atma weapon by completing a series of books, each one giving your weapon a stat boost. To complete the weapon you have to do this 9 times. Each book costs 1500 tomestones of mythology and requires you to kill 100 mobs (10 each of 10 types), run 3 specific dungeons, complete 3 specific fates, and complete 3 specific guild and company leves. Throughout the day yesterday I knocked out all of the steps for my current book other than the three dungeons. So today at some point I plan on running the three dungeons which are… Tam-Tara Deepcroft Normal, Stone Vigil Normal and Lost City of Amdapor. I figure I will ask in guild to see if anyone needs these dungeons before running them, because I would far rather complete them with a guild group. After turning in the book I will get +2 strength to my current Atma weapon and it will put me one step closer to the finished Animus. Then it begins the process all over again of grinding up 1500 tomestones of mythology for the next book. My guild thinks I am mostly insane for this, but at least Cylladora and Warenwolf are doing it with me as well. I believe Cav is maybe on the same step also. Essentially the fastest way to get the mythstones is to grind hunts, and as of yesterday Waren is now in the most popular of the hunt groups, so hopefully that will help things out a bit. Last night we recorded our 20th episode of aggrochat. Quite honestly it doesn’t feel like it has been long enough for us to rack up 20 weekly episodes. Rae was off traveling to visit some friends for the Labor Day weekend, so that left us with myself, Ashgar, Kodra and Tam. We started the show by bidding a fond farewell to Blaugust since today is the final day of the month long blogging initiative. Some pretty awesome content has come out of it, and as of last night we still had 29 people who had posted something each and every day of the month. That is pretty impressive when you consider just how much content was churned out as a result. Not everyone has posted daily on the Blaugust nook… myself included but still we have over 700 posts there during the month. In total I believe we had 52 different participants that in some way joined in the fun, so I a wholeheartedly applaud everyone on the job well done. After that we started a discussion about trash mobs, or more so why exactly we refer to non-boss encounters as trash. It hasn’t always been the case there was a point at which we just referred to everything as encounters, and in part I think that is because over the years the care and thought that went into non-boss encounters was lacking. We reminisce about some of our favorite non-boss encounters and talk at length about how we feel that encounters in general can be improved. I really enjoyed the discussion last night, so hopefully you all will as well. With the 2.35 patch Final Fantasy XIV introduced ways to dye your Chocobo unlike quite any other dye system I have encountered. Generally speaking in other games, you buy a dye or you pick a color from a selector and you end up with your color relatively simply. It might be cost prohibitive to get the color you want, but there is very little guess work. 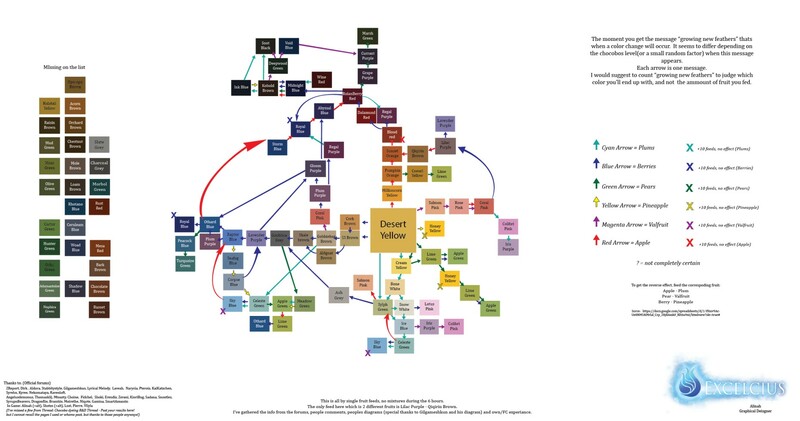 Final Fantasy XIV on the other hand introduced a system that is sheer madness. First you have to purchase seeds for various fruits that can be found on vendors. The seed is then grown in your garden and over the course of two days ripens. You can shorten this time by doing various things and the yield can be increased based on the type of soil that you use and the fertilizer. Where the madness goes into play is that these seeds increase or lighten various color sliders starting from the base yellow. When the system was originally patched in, the forums were of course a buzz with trying to figure out the formulas for each of the colors people might want. After lots of trial and error it has pretty much been agreed upon that the two types of fruit… the fruit that darkens a color and lightens a color are essentially on two different color mixing systems. The darken fruits are on RGB and the lighten fruits have the side effect of increasing CMY. This makes trying to mix a specific color absolute insanity. The end result are several different guides for mixing colors and others that list supposed recipes for specific combinations. The problem with all of this is that it doesn’t seem to be an exact science and there is a large random element to just how much a given fruit effects the end plumage. So entering into this I knew I was fairly insane. My ultimate hope was to arrive at turquoise so I fed my chocobo 15 Doman Plums and 10 Mamook Pears as a start. Doman Plums being the fruit that lowers the red value and at the same time raises the Cyan value, and Mamook Pears being the fruit that raises the Green value. The problem with this system is that you have to stable your bird and wait essentially six hours to see what the final result was. The new color is revealed to you as part of a cut scene. So before I went to bed Friday night and hoped I had made a good combination of fruits. Saturday morning I got up fairly early and was excited to log in to see exactly what the end result was. It turns out that I was pretty close and ended up with Celeste Green (R:144,G:184,B:180) which is really close to the shade of Turquoise I was actually after. So now I have the hard decision of do I leave well enough alone for the time being, because I am actually rather fond of the color. Or do I go for broke and try and push Celeste Green to the next step which would be Turquoise the shade I was actually after. 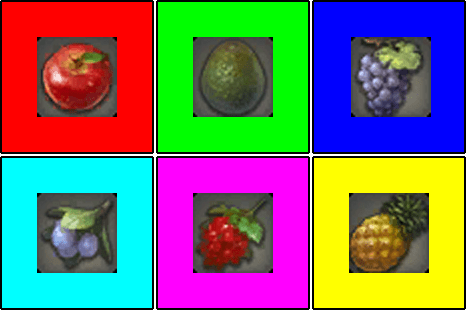 The problem is I have no clue if I just feed doman plums in the hopes of getting there, or do I need to feed O’Ghomoro Berries and Mamook Pears in the hopes of darkening both blue and green at the same time instead. For the time being, and since fruit is so insanely expensive right now I think I am going to leave things alone and just be happy I got close to the color I wanted. Now my attention turns to trying to get the Tidal Barding to go with the new color… but that is a whole different rabbit hole for another day.